“You’re gonna do it, aren’t you, Brian!” How can I refuse when a woman asks this? We were in a group on an elephant safari in Nepal, in the lowlands next to the Indian border. A trainer just gave us an elephant riding demo. A spry man stood in front of her face, pulled her ears forward, placed his foot on her trunk and pushed. She lifted her head, and he sailed over it, turned around in mid-air, and landed with both legs around her back. The trainer told us we could try, “But remember, you fall at your own risk.” There were 16 of us, and 3 had already gotten on top of her, so I gingerly approached her. and landed on my stomach on top of her head, with my feet sticking over the front. I squirmed and finally made it to her back and sat–facing the wrong end. The trainer came, and she stopped and kneeled down so I could easily dismount. She never made a jerky or unnecessary move while I was on her. I’m sure she could sense my fear (because it was emanating from every pore), and she was as gentle as a kitten. 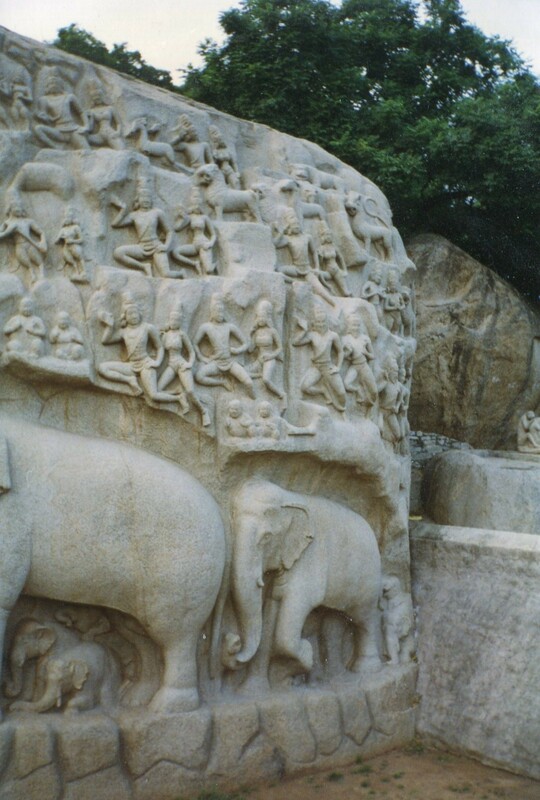 The tender group of elephants in the above picture from Mamallapuram, with the babies playing under the grown-ups thus struck a chord in me. The monument portrays the unity of life with loving realism–especially in the elephants. Indians have venerated elephants for at least 2,000 years, in the god Ganesh. Though I don’t follow any Indian spiritual traditions, I sure have a lot of fondness for some of the life forms that inspired them. This was hilarious! See? You do have writing style. You just have to believe in yourself!